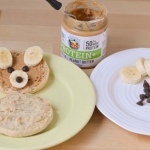 Fun teddy bear english muffins make for an easy kid friendly breakfast. spread peanut butter onto the english muffin. place on banana slices and place on chocolate chips to make it look like a teddy bear.